Observation - Northern lapwing (Vanellus vanellus) - UK and Ireland. 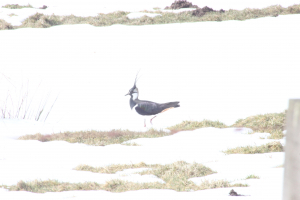 Description: A few of these birds around today but difficult to photograph against the snow. Very handsome upright crests. A few of these birds around today but difficult to photograph against the snow. Very handsome upright crests.